This meditation enables you to experience each chakra or energy center in your body. When you meditate on a regular basis, you eventually become familiar with each chakra points in the body. 1. Find a comfortable quiet spot. 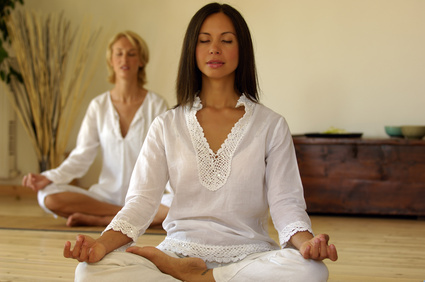 Sit in a comfortable meditation position, preferably cross-legged. Have your back upright. 2. Close your eyes and mouth and breathe gently through your nostrils. Gradually make your breath longer and deeper. 3. Move your awareness to your breath towards your stomach or solar plexus region. Observe how the energy in your belly seems to become stronger. Breathe until your breath reaches your body's base. 4. As you inhale send the breath downward along the front of your body. When you exhale, direct the energy from the bottom of your spine towards upward to the crown of your head. 5. You can visual your breath as a stream of your bright light, moving from the base to the crown of your head and then downward. 6. As you breathe throughout the whole body, be conscious of where the chakras or energy centers are. Pay attention to the base chakra, sacral chakra, solar plexus, heart chakra, throat chakra, third eye, and crown chakra. 7. Gradually move your attention along the various chakra, notice which one you experience is stronger and which feel more strongly in front and along the back of your body. 8. After awhile, focus where the concentration remain on the chakra with which you are working on. 9. Important please note: After every meditation session, you need to do simple visualization to insure that you are not overly too open to negative energies. You visualize each chakra as flower or rose that is closing its petals. 1. Find a comfortable and quiet location. Sit yourself in a upright meditation position. Close your eyes and mouth and breathe through your nostrils. Take deep breaths. Then let yourself breathe naturally. It can be fast or slow. 2. Be conscious of your body. You can increase more awareness by focusing different parts of your body. You can start to be aware your feet, calves, knees, thighs, pelvis, belly, waist, chest, shoulders, arms, hands, neck and head. This is the whole body. 3. As you notice more deeper movement in your body and your awareness one level deeper, you begin to feel your energetic shealh or sometimes called etheric body, which contains the energy flow. This layer is more subtle than your physical body. 4. As you continue this breathing observation, you become more aware of more subtle movement. These are movements of your thoughts and feelings. If you go more deeper within your consciousness, you experience your mental-emotional sheath, containing your reactive mind, emotions, and moods. 5. Be conscious your thoughts and feelings. Don't change them, just be silent witness and observe. Observe what are you thinking now and feeling at the moment. Be aware your mental-emotional sheath. 6. For awhile, you might realize that all your thoughts and feelings comes from a deeper source. All thoughts and feelings comes from experience from "I-ness" or ego. This is the realm of where your being is debating yourself and make decisions. 7. Sooner or later, your decision making sheath comes from a source. It comes from a more subtle layer of your being. You notice how joyful it is at the center. Allow yourself to be filled with joy. Your karma is stored in this layer. 8. Finally, abandon this layer and connect with your True Self. This is beyond all various layers of your being. 9. After awhile, gradually move your attention outward, layer by layer and maintain a joyful feeling. Observe anything you witness in comparison to how you felt before. If you are working with this kind of meditation, you will notice that your awareness and boundaries are expanding. 1. Sit in a comfortable meditative position with your back straight. Close your eyes and take four deep breaths. Then stop, let yourself breath naturally through both nostrils. Let your breaths be as deep and as long it wants to be. 2. Become aware of the parts of your body in contact with the floor. Breath consciously and observe yourself. You feel a downward expansion or becoming more heavy or you can conversely feel lighter or floating. 3. After few minutes, shift your attention to the left side of the body. You notice the energy shifting the left. Breathe into left leg, arm, side, neck, cheek, and temple. You notice the left side seem to be expanding. 4. Next, you repeat it the right side of the body. Your energy with shift to the right side. The right side of the body seems to be expanding. 5. Move your attention to the rear of your body. This includes back and also the nape of your neck, and back of your arms and head. Send your breath into these areas. You feel the expansion outward and to the back. 6. You shift your attention to the front of your body. You feel the energy flowing towards the front. Breathe into the front your chest, arms, throat, and face and then all the parts simultaneously. You notice the feeling of expansion towards the front. 7. Move your attention to the top your of body. You notice how the energy radiate upwards. Breathe into your shoulders, head and scalp and after that all the parts simultaneously. You feel the expansion flowing upward. 8. Last, feel the expansion of your entire body. With each breath, feel yourselft expanding outward in all directions. You repeat affirmation, such as "I am one with the Universe".